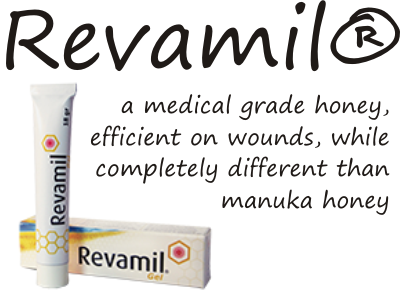 Though it is medical grade honey, Revamil it is NOT MADE FROM MANUKA HONEY. Revamil is a CE-marked, standardized, medical-grade honey, produced under controlled conditions in greenhouses, by Bfactory Health Products, Rhenen, The Netherlands. Revamil is sourced in the Netherlands from healthy bee colonies under controlled circumstances. As a result of this controlled production process, Revamil has a reproducible, highly antibacterial effect. All products are CE-registered and therefore comply with all of the safety requirements which are important for professional wound care. 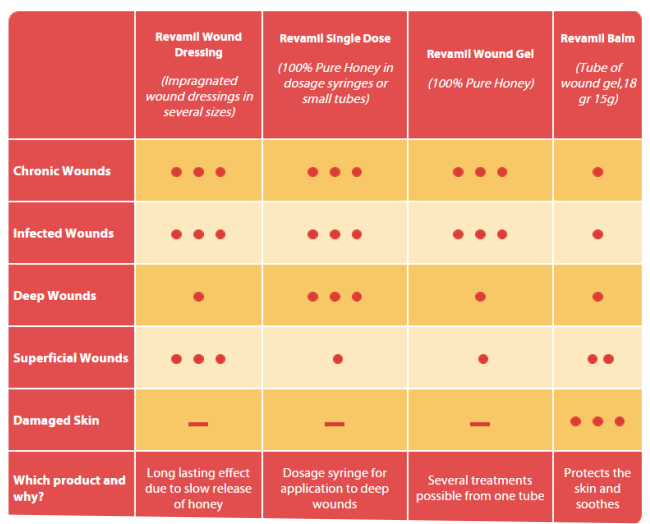 The researchers at the University of Wageningen are continually studying to find the best products in wound management and to offer a type of honey with consistent quality and reproducible effectiveness. This is the main quality of this type of honey. A regular honey is usually different from batch to batch. Though the producer does not share the floral source of this honey, we do know that this honey is made in greenhouses, which maintain controlled conditions and give the certainty that honey will always have the same composition and therapeutic properties. 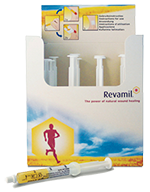 Revamil is a powerful antimicrobial. How does Revamil kill bacteria? There are 5 factors that give Revamil honey its antimicrobial powers: Hydrogen peroxide activity, MGO, bee defensin-1, low pH and high content of sugars. 1. H2O2 (Hydrogen peroxide) Hydrogen peroxide is produced by the Apis mellifera, the regular honey bees, by glucose oxidase enzyme, when honey is diluted. Revamiol honey diluted to 40 to 20% accumulated high levels of H2O2 24 h after dilution, with a maximum of 5.62±0.54 mM H2O2 formed in 30% honey. 2. MGO Methylglyoxal is found in Revamil honey at a relatively low concentration of 0.25 mM, if compared to the concentration found in manuka honey, which is up to 16.1 mM. According to scientists, MGO is a reactive metabolite that can exert toxic effects by the direct inhibition of enzymes, by genomic modifications resulting in carcinogenesis, and by protein modifications resulting in the formation of advanced glycation end products. The latter are believed to be the main determinants for pathological effects related to diabetes. The main reason that do not recommend taking manuka honey internally, at least until there are conclusive evidence that in a honey environment, MGO is not toxic to humans. While the MGO content in Revamil is way too small compared to manuka’s, tests revealed that even this small quantity of MGO has a powerful contribution at the overall antimicrobial activity of revamil. Bee defensin-1 mRNA has been identified in the hypopharyngeal gland of young worker bees, suggesting this gland is involved in production of bee defensin-1 found in royal jelly. The older bees add the secretion from their hypopharyngeal glands to the collected nectar. The enzymes then convert sucrose to glucose and fructose, and glucose oxidase converts the glucose to hydrogen peroxide and gluconic acid. These latter compounds are considered to prevent the microbial spoilage of unripe honey. Because there was bee defensin-1 found in honey, seems that even when ages, the bees’ gland are still producing it. So, this peptide also contributes to the protection of both royal jelly and honey, against microbial spoilage. 4. pH The pH of 3.2, which is at the lower end of the pH range found for honeys (3.2–4.5) A low pH triggers a unfriendly environment for bacteria. 5. High content of sugar (high osmolarity, reduced content of water necessary to bacteria). What’s the difference between revamil and manuka? 1. Revamil is always the same. Manuka changes from batch to batch. Manuka honey obtained from manuka trees (Leptospermum scoparium) in New Zealand and Australia has large batch-to-batch variation in antibacterial activity. Standardization of RS honey, the source for Revamil®, is based on a controlled production process in greenhouses. Revamil actions through its 2 major factors: Bee defensin-1 and H₂O₂. Manuka honey acts through different factors, its main antimicrobial factor being: MGO (methylglyoxal), which is in 44-fold higher concentrations than in Revamil. Yet, after this MGO was neutralized, the honey still retained bactericidal activity, due to…..unknown factors. – There is a need of more serious research here, too. see What gives honey its antimicrobial power? 3. Different bactericidal properties. Different time of anti-bactericidal reaction. Due to different composition, there are distinct bactericidal properties. In the studies, Revamil reacted slower than manuka honey. EG. – against Bacillus. subtilis, E. coli and P. aeruginosa, Revamil had much more potent rapid activity (killed them in 2 hours) than manuka honey. Manuka was rapid only agains Bacillus subtilis. – against MRSA: both revamil and manuka honey lacked rapid activity. – manuka honey was more potent than Revamil, especially against MRSA and B. subtilis. After 24 hours of incubation, both honeys killed all tested bacteria, including MRSA, but manuka honey retained activity up to higher dilutions than Revamil. In 2011, the study Medical-grade honey enriched with antimicrobial peptides has enhanced activity against antibiotic-resistant pathogens, by P. H. S. Kwakman, showed that revamil honey enriched with BP2 (Bactericidal Peptide 2) rapidly killed all bacteria tested and had a broader spectrum of bactericidal activity than either BP2 or honey alone. We should not forget that not only revamil, manuka or maharishi honey, have antimicrobial activity. Mountain, capillano and eco-honeys have exhibited inhibitory activity against H. pylori isolates, at concentration 10% (v/v), and this that locally produced honeys possess excellent antibacterial activity comparable to the commercial honeys. Stay away from these ones. Revamil can be found in 4 different products: Revamil Wound Gel, Revamil Balm, Revamil Single Dose, Revamil Wound Dressing. Revamil hydrophilic wound gel consists of 100% pure and sterilized medicinal honey with a high enzyme content and a low pH. It is recommended for chronic and infected wounds. – Treat the wound once per day during the first week, thereafter every 2 to 3 days. 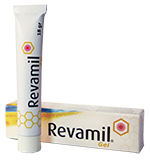 Revamil® Balm is made of neutral ointment combined with pure honey, and has effective wound-healing and antibacterial properties. It is kind to the skin and is primarily suitable for the treatment of surface wounds, such as grazes and wounds caused by the scratching of eczema. Revamil Balm can be applied in professional wound care and as an ointment for domestic first aid. Buy now to make sure you’ll have it when you’ll need it! These dressings are made from polyacetate impregnated with 100% pure, honey with a high enzyme content and a low pH. They do not stick to the wound and guarantees the slow release of the honey into the wound bed. It should be applied like the rest of Revamil products, clean the wound, cover it with the dressing, secure the wound gauze, treat it once per day for a week and then avery 2 or 3 days. It consists of 12 syringes of 100% pure, medicinal honey with a high enzyme content and a low pH. Revamil Single Dose has a strong and long-lasting antibacterial effect. A syringe is for single use and sufficient for one treatment. The honey gel can be applied thoroughly to deep wounds and under the edges of wounds. The wound should be first cleaned, then the honey gel to the wound depressing the syringe until it is empty. Cover the wound. Treat the wound once per day for a week, then every 2 or 3 days. What are Revamil products good for? Here are the efficiency of the Revamil products, so you’ll get an idea which is good for what. The more dots, the most efficient. The list is offered by the producer itself. Try the domestic Revamil balm, it’s good for regular surface wounds, such as grazes and wounds caused by the scratching of eczema. Here is one at a good price Revamil Honey Balm Wound Ointment 15g.
! The producer does not mention them to be suitable for burns, so I would not be a pioneer and try it on my skin. I would rather buy one that it us well-known to work on them. Like Medihoney antibiotic gel, followed by a proper dressing. Medihoney dressings – the best wound care dressing products What are oligolectic bees? “Revamil actions through its 2 major factors: Bee defensin-1 and H₂O₂. THEY DO NOT EXIST IN MANUKA HONEY” Could you please mention your sources ? Seems to be false, Manuka honey do have a peroxide activity like other honeys. The source has a link in the following paragraph. Anyway, it seems that although defensin1 is found in small quantities in all honeys, according to that study the large amount of “MGO abrogates the antibacterial activity of defensin1 and modifies MRJP1 in manuka honey.” The same thing is assumed to happen with the enzyme glucose oxidase, which is responsible for generating hydrogen peroxide (when diluted, or in contact to a wound). Yet, in manuka honey with no, or low quantities of MGO, the enzyme could still be in effect. But manuka honey used for skin therapy does have MGO. “MGO could also have negative effects on the structure and function of other proteins/peptides in manuka honey”, so, I think I am right when I say the antibacterial and wound healing properties come from different components in manuka honey when compared to Revamil. Yet, if you know other studies that tell the contrary, please let me know. The research of manuka honey and honey in general continues every day, so there could be news available that I don’t know about. PS. I agree that I should make this info more clear in the article. Wow never knew honey is so healthy for us thank you so much for sharing laura. You list a lot of different types of honey here which I appreciate. Which would you recommend as the best overall honey in your opinion? There is no such thing as the best overall honey. What is good for me is not good for you, as we are completely different persons. Considering the floral source of a honey we can tell if it is good or not for our bodies, or for our taste buds, of course. But they are all good, all full of health benefits, and with great tastes. And if you want to use it as medicine, than start from your condition and read which one you need. Either way honey will always be by your side! Only don’t forget to be RAW. It’s the only one that counts.